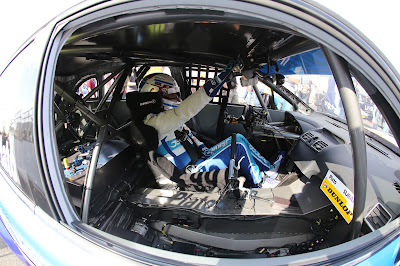 Silverstone played host to the penultimate rounds of the Dunlop MSA British Touring Car Championship last weekend with both Colin Turkington and Jason Plato in contention for the 2016 championship title. Between the pair they were looking for a good haul of points in order for them to be in a strong position for the final rounds some two weeks later. 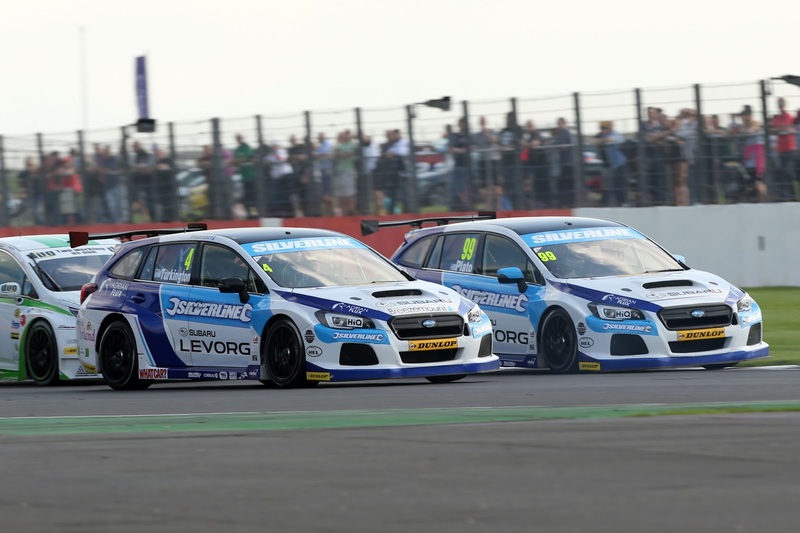 Following Saturday’s qualifying session, Warren came out on top of the four Silverline Subaru BMR Racing drivers placing his Levorg 13th on the grid after jumping up the order on his final lap from 21st. Jason would line up for race one right behind him with James 23rd so it was all to play for. Unfortunately Colin was forced to start from the back of the grid following a penalty he picked up last time out at Rockingham, his third of the season. All four made great getaways, but a tap from behind for the team boss Warren sent him into a spin that caused Jason to take evasive action leaving the boss stranded sideways on track allowing all of the chasing pack to pass. He did however manage to get the car started again albeit down in last position but clawed his way back up to 21st place before a puncture on the final lap forced him to retire from the race with great disappointment. It wasn’t going to be an easy task for Colin following the grid penalty, but despite starting from the back of the grid he carved his way through the field, passing no less than 19 cars in the process, to finish in an outstanding 10th place. Jason dropped back down the order at the start but impressively fought a good fight and gained a number of positions back to finish in a comfortable point scoring position of 12th. James had a great start to his first race of the day and by the end of the first lap was up to an astonishing 17th from 23rd on the grid. Unfortunately he too was forced to retire on the final lap with a front left puncture. MG were initially awarded first and second positions although the final race result was amended due to the MG’s being excluded from the race and both Colin and Jason were promoted two places and up to 8th and 10th respectively. Colin had a great start in the second encounter as did Jason, with both Subaru Levorgs running side by side into Beckets and then again into Luffield where Colin eventually stayed ahead in 8th with Jason tucking up behind him in 9th by the time the opening lap was complete. Warren and James also made up places on the first lap into 23rd and 24th respectively. Colin and Jason then worked in formation picking off their targets one by one as they fought their way through the field into 4th and 5th places. Warren made it up to 17th before succumbing to his second puncture of the day finishing all the way down in 29th with James securing 23rd. James also scored a point for setting the fastest lap of the race. Andrew Jordan was victorious as he took the win in the Ford Focus. For the final showdown of the day, Warren suffered more misery as he was unable to make it to the grid for the third due to an engine issue. Colin doubled up with a second 4th place finish after passing Jason on the final lap after the latter brought more misery to the team after he too suffered a puncture. He managed to finish the race by limping across the line in 12th place and still in a point scoring position after running fourth throughout the 22 lap encounter. James brought the third and final Subaru Levorg home in 21st. Honda’s Gordon Shedden took the win. There is just one event remaining this season with rounds 28, 29 and 30 of the Dunlop MSA British Touring Car Championship being held at Brands Hatch Grand Prix circuit on the 1st and 2nd of October. Sam Tordoff currently leads the standings from the Honda duo of Shedden and Matt Neal. With a maximum of 67 points up for grabs, there are a further 5 drivers who can mathematically still walk away with the 2016 championship title that includes Rob Collard, Mat Jackson, Andrew Jordan and our very own Silverline Subaru BMR Racing drivers Colin and Jason with just 58 points separating the top eight. Warren commented “The number 39 crew experienced another tough weekend at Silverstone, the circuit really suits me as the racing lines are pretty much the same as when riding a superbike here unlike the other circuits where the car racing lines are so different. “We managed a great qualifying result where we were the quickest rear wheel drive car which gave me a confidence boost for the race day on Sunday. Starting from P13 in race 1 was an achievement for me, I was really looking forward to race with the front runners only to be knocked off the circuit on turn one. “Race 2 I had a puncture and then we didn’t manage to get the car out for race 3 due to a mechanical issue so all in all quite a rough day! “As usual I am immensely proud of the team who work tirelessly and put every bit of effort in, also to James, Colin and Jason who work so incredibly hard to achieve the results that they have done this year so far, especially at Silverstone which was always going to be a very hard track for the Subaru’s to compete. Colin commented “I left Silverstone hugely satisfied after three strong finishes despite having to start the first race from the back of the grid. An unexpected good haul of points at one of our toughest circuits means I go to the final meeting 37 points from the top of the table and still a contender for the championship. “Making good progress early in the day and passing 19 other cars to finish 10th in race one was the perfect start and the key to my weekend. The grip on the circuit was unusually low, so we had to work hard to find a good setup, but thanks to my engineering team we did and I was able to keep progressing and take home another two fourth place finishes. Jason commented “Silverstone was always going to be a tough one for everyone at Silverline Subaru BMR Racing as it is a circuit which the lap time is heavily dependent on engine power and therefore straight line speed. To be so far off in qualifying taking into account the skill of the engineers, drivers and equipment at our disposal is beyond disappointing. “Whilst we made progress in the races, this was mostly due to us overtaking cars that were experiencing tyre degradation issues. We are just so slow in a straight line it is almost impossible to mount an attack. “My frustration hit a new high with a puncture on the last corner of the last lap in race three whilst in 4th position.